The Brown Bear (Ursus Arctos) – the national symbol of Finland – is the largest carnivore in Europe. 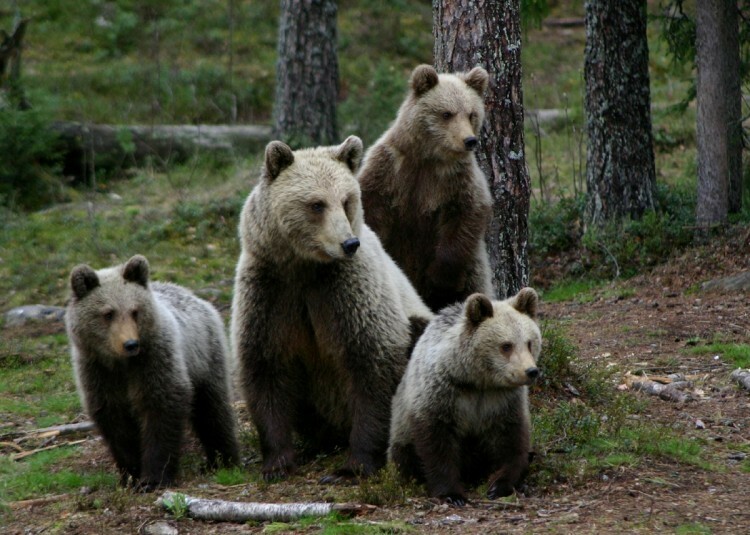 Eastern Finland is home to a large amount of brown bears. Bear watching and photography trips are organized in the Wild Taiga area from April to September. On the overnight trips you can stay in a hide, giving you a better chance of seeing a bear visiting carcass laid down especially for them. Bear watching trips are organized for individuals and groups alike. The Wolverine (Gulo gulo) is the largest land-dwelling species of the Mustelidae or weasel family (the Giant Otter is largest overall) It is a mammal slightly bigger than the Badger. The shy wolverines prey at night in the dusk, and it is very rare to observe one in the wilderness. 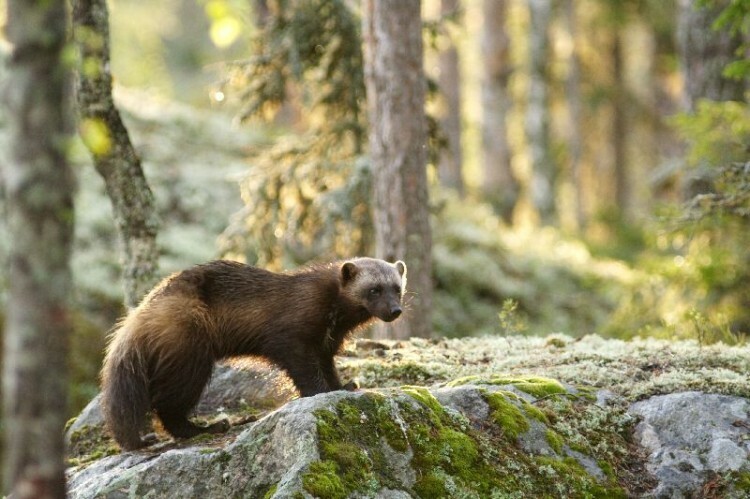 The Wolverine, however, visits the hides all year round and from early spring until autumn there is enough light to see it properly and take decent photographs of it. 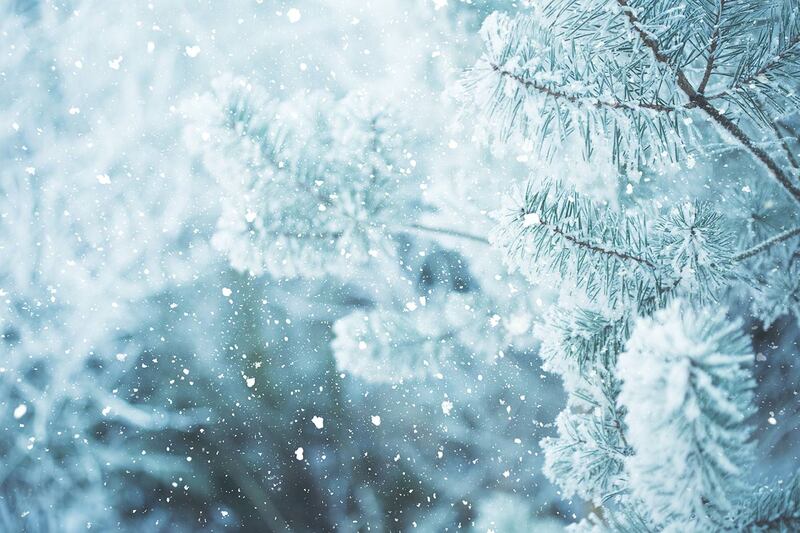 With a bit of luck it can be seen even in the daytime. The Gray Wolf (Canis Lupus) is a mammal living in packs, belonging to genus canis. Most of the wolves in Finland live in the eastern forests, though it is found all around Finland. The Wolf is on the move at all times of the day and night but mainly at dusk and in the night. 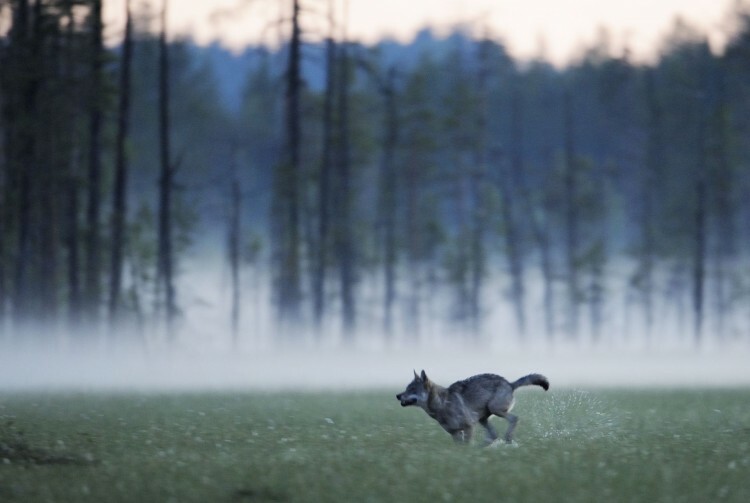 Wolves are not that common a sight from the hides, but there is a chance you will see them in Kuhmo border zone area. The howling of wolves at night makes the hairs on the back of the neck stand up, even on the most experienced wilderness explorers! The lynx (Lynx lynx) is Finland’s only species of cat found naturally in the wilds. The population has become abundant through preservation (base assessment over 1000 individuals) and lynx are currently encountered throughout the nation. The weight of a lynx is typically 8-25 kg, body length 70-140 cm and tail 15-25 cm. The spotted fur of the lynx is red-grey in the summer, grey-white in the winter. The lynx is a carnivore. In Kainuu, the lynx finds nutrition in rodents, hares and wild forest reindeer, and reindeer in general in the reindeer management area ranging from Suomussalmi to north to Lapland. Fresh meat is the main nourishment for lynx, as their teeth are poor at gnawing carrion. For this reason, lynx cannot be observed in the manner of bears, wolves and wolverines, with which carcass is used to attract otherwise invisible prowling beasts within reach of the camera. The lynx is nimble and silent in its movements, and its sense of hearing is well-developed, unlike its sense of smell. For the most part, the lynx targets its prey by using its hearing and sharp eyesight. Due to the acute senses a lynx has, human beings rarely get to catch a glimpse of this animal in its natural habitat. However, those wishing to do so can certainly see this beautiful feline predator of the north by visiting, for instance, Ranua Wildlife Park.